Bremen, Germany is a part of the Logistics Plus® network. This office specializes in heavy-lift, break bulk, and project forwarding solutions. We’re your global project cargo experts! Bremen is located in northwestern Germany. The City Municipality of Bremen is a Hanseatic city in northwestern Germany, which belongs to the Free Hanseatic City of Bremen (also called just “Bremen” for short), a federal state of Germany. As a commercial and industrial city with a major port on the River Weser, Bremen is part of the Bremen/Oldenburg Metropolitan Region, with 2.5 million people. 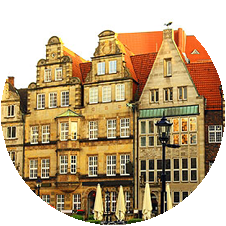 Bremen is a major cultural and economic hub in the northern regions of Germany and is home to a large number of multinational companies and manufacturing centers. Bremen is also home to a Logistics Plus office where we proudly serve both small and large businesses throughout the region. At Logistics Plus, we are more than just a local logistics company – we are a team of talented and caring professionals that share a passion for excellence, service, and community. Our Bremen staff are experts at managing project cargo. Your logistics plan will be customized for your unique project needs—from a comprehensive, pre-shipment evaluation of potential risks, costs and delivery schedules, to route and port surveys, coordination of proper packaging of components, required documentation handling, and transportation mode analysis. If you’re located in Bremen, or any other surrounding community, your friends at Logistics Plus are ready to provide you with local, domestic, and global project forwarding and logistics services. Additionally, we’ll show you how our people in Germany put the “plus” in Logistics Plus by doing the big things properly, and the countless little things, that together ensure complete customer satisfaction and success! Contact us if you’d like our help with your project logistics.